The NuMesh system defines a high-speed communication substrate optimized for off-line routing. By determining possible communication paths at compile time, highly efficient hardware and software constructs can be exploited to yield superior network performance. These communication paths can be independently tuned to allow more utilized paths greater bandwidth. Although communication paths are scheduled, data need not be sent during every scheduled cycle. Flow-control protocols allow for empty communication cycles as well as for data backup in the network. Limited gate delays between NuMesh registers as well as single-cycle message transfers allow for a high clock frequency and low network latency. A highly pipelined architecture for this communication is presented and a mechanism for efficient flow-controlled communication is discussed. A unique communication protocol is presented and shown to provide single-cycle transfers between nodes. An overview of the necessary compiler support is also provided. Preliminary results and a description of the current hardware and software status are listed. 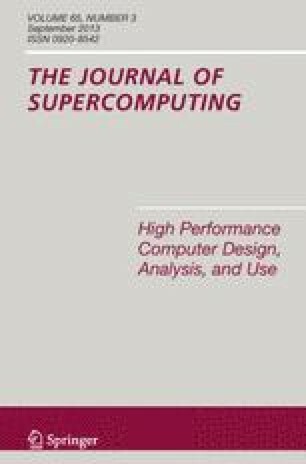 An earlier version of this paper was presented at the 1995 International Conference on Parallel Processing Techniques and Applications.